Discover your home away from home. Stay here and enjoy our relaxed lifestyle here at the Lake of the Ozarks. 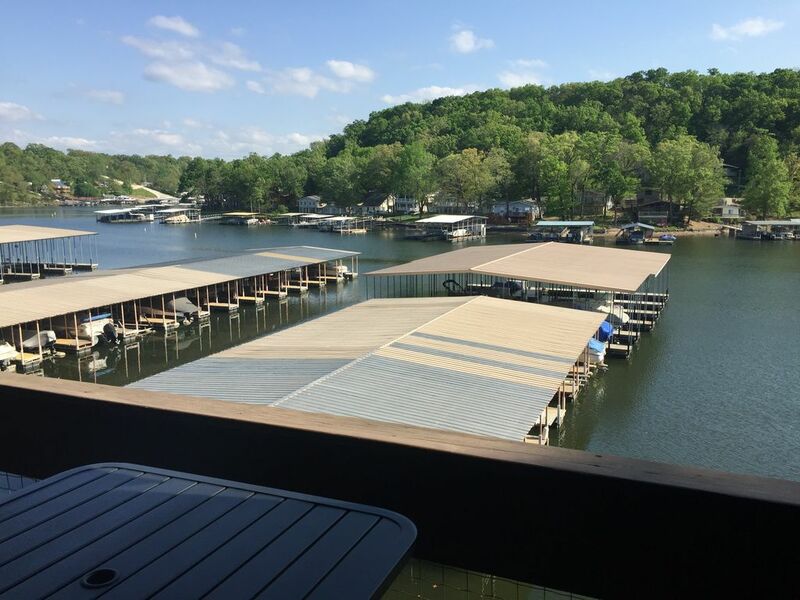 The Knolls has the MOST AMENITIES of any condominium association at the beautiful Lake of the Ozarks. We have it all Boat Slip available to rent, Boat Ramp, Indoor & Outdoor Pools, Hot Tub, Sauna, Steam Room, Indoor & Outdoor Tennis Courts, Playground, Swim Dock with Ladder, Fitness Center, Basketball Court, Pool Table, Arcade Room & a Large Quiet Cove for swimming & fishing! You'll enjoy beautiful views of the lake while relaxing on the deck and a completely new and refurnished unit with plasma TVs with built in DVD in every room. This unit has all new furniture, carpet, televisions, appliances, tile and dishes. For the BEST DEAL at the lake please pick me. Plain and Simple if you like Family Fun or just want relax by yourself it can't be beat. You feel complete comfort just like home. Roped off Swimming Area and Dock on the Lake, Indoor and outdoor Tennis Courts, Basketball Court, Fitness Center, Boat Slip Rentals, Boat Ramp, Indoor and Outdoor Pools, Fire Pit, Barbecue Pits and Playground. We enjoyed our stay. The condo was nice but a bit dark. Well equipped kitchen and laundry was great. There was a nice view of the lake. Unfortunately the broken seal on bedroom windows made for a lousy view. The back bedroom is very dark. The beds were comfortable and the TVs in every room were a bonus! We totally enjoyed the indoor pool, hot tub and steam room and workout room. Also there was a nice path to walk along the water. There was a light that did not work and a repair person was quickly sent over. Unfortunately it was not an easy fix and they had to come back the next day to work on it. Overall, we enjoyed our stay. Was a good fit for our family weekend away. Very nice property ...Definately the arrangements fit our family well for now (only say that because our kids are 2 and 8 and a boy and girl) They probably wont want to bunk up in the same room in a few years. The pool, playground and arcade kept the kids entertained also. For a small weekend getaway while the kids are still small, I would look into renting this again. Everything about our stay went smoothly. Accurate check-in information was provided on a timely basis. The property was clean and ready to go when we entered. The property has a nice view of a quite cove although the view from the bedroom was obscured because the seals in the windows were broken, creating foggy windows. The only housekeeping issue was that coffee grounds were left in the coffee maker (we discarded ours when we left, so the next guest won't have that experience.). The a/c kept the unit nice and cool on a very hot Ozark weekend. One bedroom had two french doors opening to the living room, with full-length windows that had no window covering, so only one of the bedrooms offered privacy. We didn't cook, but the kitchen was adequate if guests wanted to do so, and the fridge kept our beer nice and cold. The furniture in the living area could use an upgrade/update-it was functional but not comfortable without throw pillows as additional seat cushioning. The decor is on the dark side and a bit outdated but met what would be a reasonable expectation for an older property. The overall property is quiet and seems well-maintained. We didn't use the pool, but can confirm its existence and it looked fine from the outside looking in. We encountered a handful of other residents/guests and all were in good spirits, well-behaved and generally quiet. We did have a fellow, perhaps over-served at one of the nearby watering holes, knock on the door thinking it was his place. He was pleasant enough and went on his way without incident when we advised him of his error. Based on the absence of a missing-person report on the local news the following morning, we can only assume a happy ending to his adventure, but can confirm a happy ending to ours! exactly as advertised!!! very clean and easy to relax in! This was the first time we have vacationed at the Lake of the Ozarks, so we were pretty much rolling the dice. But we were extremely pleased! Everything was clean and inviting! The only thing that prevents 5 stars is that there were no drapes or blinds on one of the doors to the bedrooms. That seems like a really easy fix to help with privacy. Otherwise, we loved it! Second year coming here and we absolutely love it! Thank you for choosing us for your vacation stay. We hope to see you again soon! Just Minutes from it all! Shopping, Go Karts, Golf, Dining, Boating, Water Park and Much More!